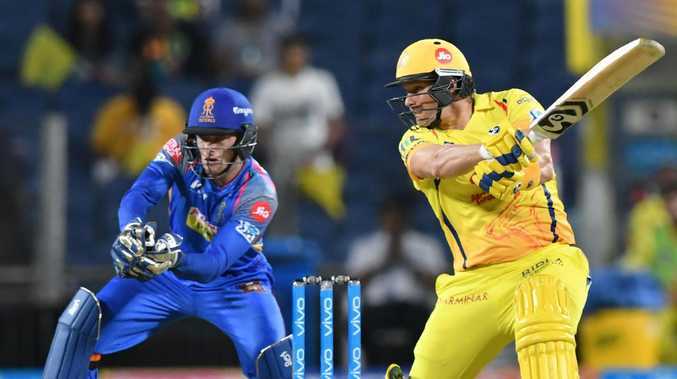 SHANE Watson has capitalised on a dropped catch in the first over to whack 106 as Chennai Super Kings beat Rajasthan Royals by 64 runs in the Indian Premier League on Friday night, local time. Chennai shares the lead with Kolkata Knight Riders, Sunrisers Hyderabad, and Kings XI Punjab, who all have three wins. Watson was on eight when he was dropped at first slip by Rahul Tripathi off Stuart Binny. The Australian went on to make 106 off 57 balls in Chennai's total of 204-5. Rajasthan, which won the toss and opted to field, was bowled out for 140 in 18.3 overs. The Royals never looked in the game once they lost three top-order batsmen for just 32 runs in the first six overs. Chennai's home games have been shifted to Pune for security reasons, and captain Mahendra Singh Dhoni welcomed the move. "The people over here, they supported me when I played for Pune, so you could say that it was good that I could return the favour," Dhoni said. "Yes, it's Chennai Super Kings and not Pune Super Kings, but by the end of the seventh game, we'll see more yellow here." Suresh Raina recovered well from the calf injury that forced him to miss the last game, hitting 46 off 29 balls. Watson and Raina shared an 81-run, second-wicket stand off 44 balls against wayward seam bowling by Binny, Ben Stokes and Jaydev Unadkat. Rajasthan pulled back through legspinner Shreyas Gopal (3-20), who removed Raina, Dhoni (5) and Sam Billings (3) in successive overs. 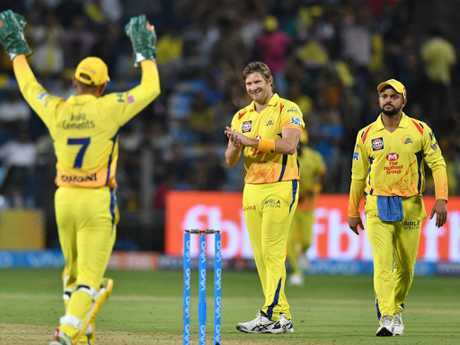 Chennai Super Kings cricketer Shane Watson (C) celebrates with teammates after taking the wicket of Rajasthan Royals cricketer Krishnappa Gowtham. But Rajasthan conceded 54 runs off the last seven overs. Watson smashed nine fours and six sixes before he finally fell off the penultimate ball of the innings when he was caught behind off Ben Laughlin (2-38). Rajasthan's run chase fell apart after medium-fast bowler Deepak Chahar (2-30) bowled an unchanged spell of four overs upfront. He took out captain Ajinkya Rahane (16) and Sanju Samson (2). Also among the wickets were Dwayne Bravo (2-16) and Shardul Thakur (2-18) as Rajasthan's confidence drifted away. Legspinner Karn Sharma finished off the tail with 2-16. Stokes made a scrappy top score of 45 off 37 balls but Rajasthan's multimillion-dollar signing perished in the 14th over while going for a slog sweep off Imran Tahir's leg spin. Rajasthan has two wins from five matches. "Watson was positive from ball one, and T20 cricket is just about that," Rahane said. "I felt we bowled slightly on the poor side. They bowled straighter, and those lines and lengths were difficult to hit."